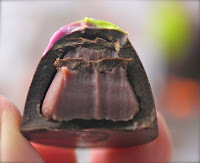 Today was Day #4 of Chocolate and Halloween Cocktails Theme Week. 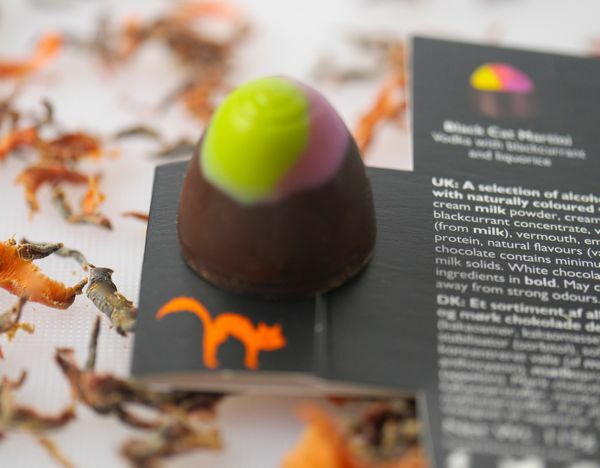 The "Black Cat Martini" chocolate from Hotel Chocolat (UK) was infused with blackcurrant and "liquorice" and had a fairly strong vodka kick. The flavors were authentic and layered, revealing themselves one at a time, which made this filled Halloween cocktail chocolate more intriguing and fun. Today's Black Cat Martini was the last (of four) different seasonal cocktail chocolates from a Hotel Chocolat "Choose Your Poison" 16-piece assortment box.